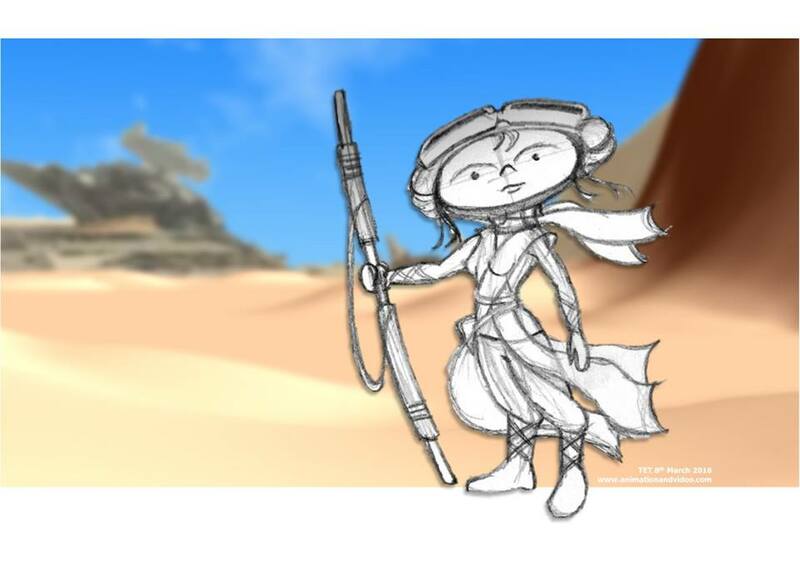 Since I hadn't talked about my upcoming CrazyTalk Animator 3, G3, Desert Scavenger Character, in any great detail (and because finishing her is taking longer than anticipated) I thought you may be interested to look at the project in a little more detail. Back in March of 2016 I had this idea to create a Star Wars, The Force Awakens, parody animated short. 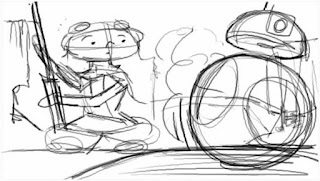 Seeing the little ball droid, BB-8 roll around at speed through the desert reminded me so much of the old WB Road Runner cartoons. Since everyone was out looking for BB-8 and Rey was doing her best to make sure he didn't get caught, I thought that could be done in a humorous, Road Runner style parody. 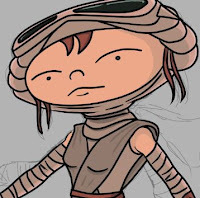 With that thought in mind I gathered together a few images of Rey and set to work creating a character that kind of looked like her but getting an actual likeness wasn't critical. I just wanted to create an original looking character that would suit the humor I was going for. It didn't actually take me all that long to come up with a design I was happy with. The next day I fired up iClone to make a 3D background to put my final character design into. My plan was to do all the backgrounds using iClone so I wouldn't have to draw and color them myself - saving time. Final character design with iClone, 3D background. 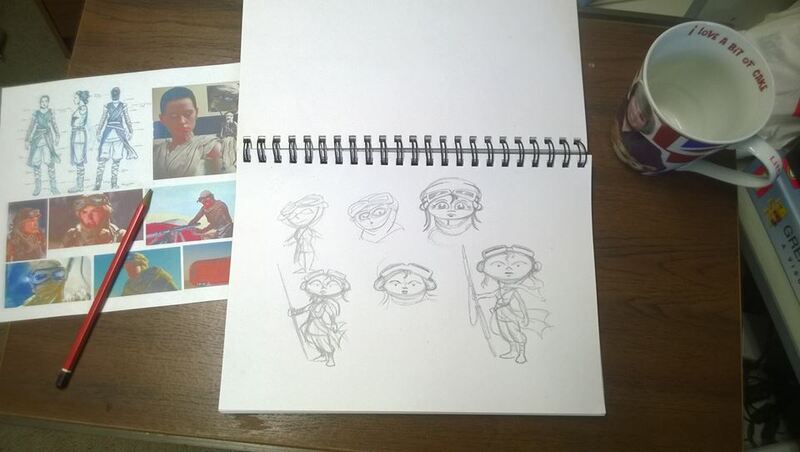 I've mentioned previously in this blog that I did write a script for my animated short. It's not a complete script, more like just the first sequence. If you think of a Road Runner cartoon, this would be the character introduction, freeze frames, followed by Coyote's first failed attempt. 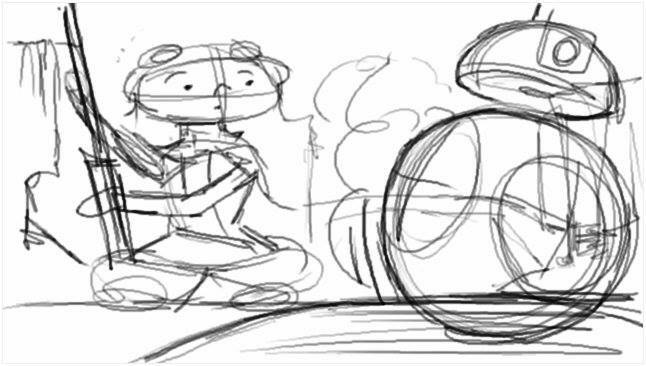 That much has been storyboarded, completely. At that point life got in the way and the project was shelved. Toward the end of 2016 I collaborated with the creators of Toon Boom Harmony to write a review on learning their software. As part of that process I took my concept image of Ma-Rey and turned it into a short animation. Unfortunately I couldn't go any further with this as I only had a limited license period and I had no intention of taking out a subscription - Harmony is just too fully featured for my modest needs. Earlier this year Reallusion released CrazyTalk Animator 3, a significant upgrade from 2 with a whole new way of creating characters quickly. Known as G3 characters, their major features include, easy to implement bone system, mesh warping, and raster based sprites. Importantly these new, single angle characters are quick to implement - if you're dedicated enough you can create a moderately complex character in about 24 hours over 2 days. I figured the time was right to revisit Ma-Rey Sue, and develop her as a G3 character. Unfortunately it had to wait until I'd finished developing my Color Monkey characters (who'd been shelved and revisited numerous times more over several years) but now I'm back on track, and the character is nearing completion. Since G3 characters are raster based it means shading and other fine detail is easier to include in the design. Also, I'm only creating a 315 degree view of the character (for now) so I needed to redesign her head and feet/legs to suit that configuration (so she can walk from side to side and still look at the camera). 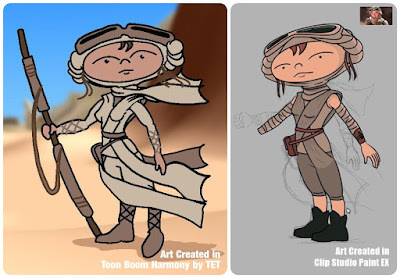 Below you can see a comparison of the character to her Toon Boom Harmony design. The updated version is being created in Clip Studio Paint EX. I'm still hoping to finish the character some time this month. I have been working on her for about an hour, each weekday, so she is progressing. Once done she'll be available from my Reallusion Marketplace store.